It’s been a long time since I’ve done an exclusive RoundLetters profile on a band/artist. Thus, when one comes along that means it really counts. It is bands like this that make me smile in the morning on my crisp and brisk walk to school. They keep me calm, but they also inspire me. They sing in English, so knock that worry out of your head. 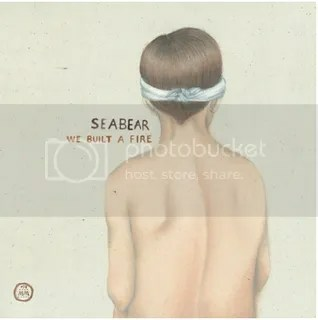 Seabear started out as a lo-fi solo project for Sindri Már Sigfússon, but it has grown to be a full band. He is now joined by Gudbjörg Hlin Gudmundsdottir, Ingibjörg Birgisdóttir, Halldór Ragnarsson, Örn Ingi Ágústsson, Kjartan Bragi Bjarnason and Sóley Stefánsdóttir. All names that I won’t even TRY saying. Sigh, I shake my head in shame! Together, their sound is big and small at the same time. They conquer the corners first and then move their way in. They come closer and closer, first touching your skin for just a second, then for two.. gradually they find a place where you can hold them. The album has classic title — this band will build up a slow warmth, and they are proud. They want to share this feeling with you because it’s just so good. They have an impressive track record — the song “I Sing, I Swim” has a ton of covers on YouTube by adoring fans. The aforementioned Grey’s Anatomy scene. They had a song called “Cat Piano” (there’s an amazing GIF of it on their MySpace page) on Finding Neverland and Gossip Girl. Et cetera. But now it’s time for We Built a Fire to shine. Yes, it may sound more produced than the last album, but it’s for a good price (I’m sure). There’s a lot going on — tiny details that should be paid attention to, and without the production quality, that wouldn’t be able to happen. Sometimes they remind me of the Toronto pop-punk band Still Life Still — just without the brash lyrics and harder sound. It’s the soft, communal vocals that do you in. Anyways, I think it’s time for you to decide for yourself. Seabear will be playing at Toronto’s the Horseshoe Tavern on March 31. I hope to see you there! This entry was posted in Uncategorized and tagged Emerging Artists, Music, New Releases, Profile, Promotion, Recommendation, Review, Single, Take a Look, Upcoming concerts, Video by Jessica Lewis. Bookmark the permalink.